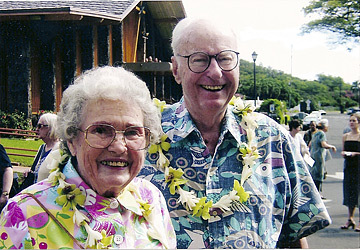 Quinn stands with his wife, Nancy, outside the Star of the Sea Church in 2004. When William Quinn graduated from law school after fighting in the Pacific in World War II, friends suggested he try politics. Quinn laughed. "I wouldn't know what I'd be. I'd either be a Republican and push or a Democrat and drag my feet," Quinn recalled in a University of Hawaii oral history interview conducted by Dan Tuttle and Chris Conybeare. Quinn went on to be Hawaii's last appointed governor in 1957 and the first elected governor in 1959. His time in office was wrapped up in both the territory's drive for statehood and the running battles the Republican governor had with an emerging Democratic party's control of the Legislature. "I was an accident. That's what they -- the Democrats -- thought so, and I think the Republicans probably did, too," Quinn said in a 1988 interview. Quinn blamed the factions within his own GOP that failed to support his administration and then the political problems that tormented his unsuccessful 1962 re-election campaign when his lieutenant governor, Jimmy Kealoha, opposed him in the Republican primary. Kealoha lost, but Quinn failed in the rematch with John A. Burns, who went on to serve three terms as governor and has been largely credited with forging the Democratic Party that still controls much of Hawaii's politics. Quinn, in his oral-history interviews, said statehood was the most important accomplishment. "It was absolutely a necessity for Hawaii to become a state. You got to remember, and many of us don't, that in those days, the governor was imposed upon the people by a presidential appointment," said Quinn, who himself was named territorial governor in 1957. "The judges were imposed. ... We didn't have any vote in Congress, although we paid the taxes," Quinn said. "It was a very fundamental matter of Democratic, Republican philosophy that these people here, in these islands, were deserving of statehood, and were first-class citizens and should be treated as such," he said. When Hawaii became a state, suddenly it had to obey all the federal laws, something that Quinn recalled caused a strain to the sometimes cozy business relationships that existed. Antitrust laws were a particular problem, Quinn recalled in his oral history. "We had people in interlocking directorates. ... It was just astonishing the way people in the major agricultural corporations also sat on the boards of banks and also sat on the trust companies. "We said, 'Look, we are going to endorse this and therefore you had better attend and clean up your act. "I was dealing with friends of mine who had been my supporters who were saying, 'What the hell are you doing?'" Quinn said. The 87-year-old former governor was remembered yesterday by U.S. Sen. Dan Inouye as "a friend of Hawaii and her people." "If not for Quinn, the East-West Center would be a memory," Inouye said. "By his executive order, he kept the center alive. Hawaii owes much to Bill Quinn. "One can also see the results of Bill's unwavering support of the military in Hawaii. His good relationship laid the foundation for all the governors who have succeeded him," Inouye said. Charles Morrison, EWC president, said that Quinn believed Hawaii should play an instrumental role in bringing the United States closer to the Asia-Pacific region and supported the proposed East-West Center. "In November 1959, he endorsed the center proposal in remarks during the Statehood Dedication ceremony," Morrison said. "Governor Quinn continued to seek visibility and support for the new center even when its establishment was secured, through legislation offered by then-Senate Majority Leader Lyndon Johnson. Governor Quinn succeeded in winning a strong endorsement for the center from President Eisenhower when the president stopped in Hawaii in June 1960." Quinn served briefly as chairman of the Board of Governors of the East-West Center. "We are eternally grateful for Governor Quinn's vision and staunch and unwavering support," Morrison said. Others such as former ILWU social worker and former University of Hawaii regent Ah Quon McElrath recalled that Quinn had a a keen appreciation for Hawaii's problems and was willing to work with her. "I found him to be a very human person and very willing to learn," McElrath said. "There were always those who didn't have any sympathy for the poor or for social services, but he didn't give me that feeling. "And I will tell you that on a personal level, he was a quick study. If he didn't know a subject, he said he would find out about it and get back to you, and he did," McElrath said. U.S. Sen. Dan Akaka recalled that Quinn was one who would work with both Democrats and Republicans. "Bill Quinn was a very friendly person who worked in a bipartisan fashion," Akaka said. Although Akaka recalled that Quinn was remembered for his renditions of "When Irish Eyes Are Smiling" at social and political functions, Quinn in his oral history recalls that his favorite song was "Ke Kali Nei Au," the Hawaiian wedding song. "So I sang it, just for our own amusement, really. But then thereafter when I'd go to a rally, and this gal would step forward and hit the key of C and we'd sing." From that day on, Quinn would lead the program.